Even Michael Beaman’s mother calls him Banger. It’s a nickname Beaman has had since middle school. So when Beaman convinced four longtime friends to open a brewery, it seemed only natural to name it Banger Brewing. From left, Eddy Quiogue, Marc Longwith, Michael Beaman and Roberto Mendosa look over a prototype of a beer sampler tray inside Longwith's garage May 13. Their company Banger Brewing is scheduled to open in October at downtown's Neonopolis. A Banger Brewing bottle sits in co-owner Marc Longwith's garage. The business plans to rotate beer flavors with the season. Even Michael Beaman’s mother calls him Banger. It’s a nickname Beaman has had since middle school, where he met his friend Marc Longwith. So when Beaman convinced Marc and three other friends, Nick Fischella, Eddy Quiogue and Roberto Mendosa, to open a brewery in downtown Las Vegas, it seemed only natural to name it Banger Brewing. The longtime friends, united in their love for experimenting with do-it-yourself home brewing, plan to open Banger Brewing in Neonopolis. They are taking advantage of the new ancillary brew pub city of Las Vegas ordinance, passed May 2 . It allows businesses looking to brew their own beer to sell it on premises . The new license comes with an origination fee of $7,500, a less expensive option compared to a $75,000 liquor license, allowing for not only beer but also liquor and gaming. Beaman and company hope to fill a hole not only in the local craft brew market but also on Fremont Street. The outdoor mall and entertainment venue has seen a number of businesses come and go — a failed movie theater, Krave Massive and air-conditioning problems. The mall sits between the East Fremont District and the Fremont Street Experience. The brewery is set to occupy a 3,000-square-foot portion of Neonopolis, next to the Heart Attack Grill. For now, the group plans to install a 3½-barrel system, brewing six to eight beers. The Banger partners have been experimenting with various beers in Longwith’s garage in preparation for the September opening : a jalapeño hefeweizen, watermelon wheat and a cilantro and lime beer. Beaman said the eight or so beers will be rotated with the seasons. Heavier, dark beers will be rolled out for winter months and lighter, citrus beers for summer. 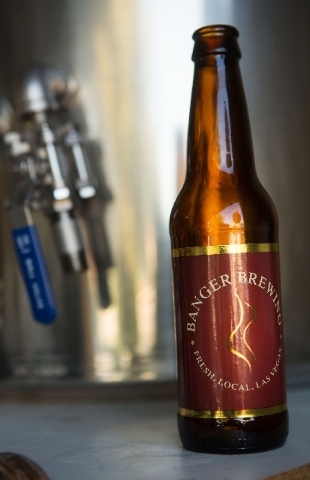 Banger Brewing has been selling beer at festivals and events in the area for three years. And while customers may come for the beer, the group hopes they’ll stay for the atmosphere. Work on Banger Brewing’s space in Neonopolis is slated to begin this summer.